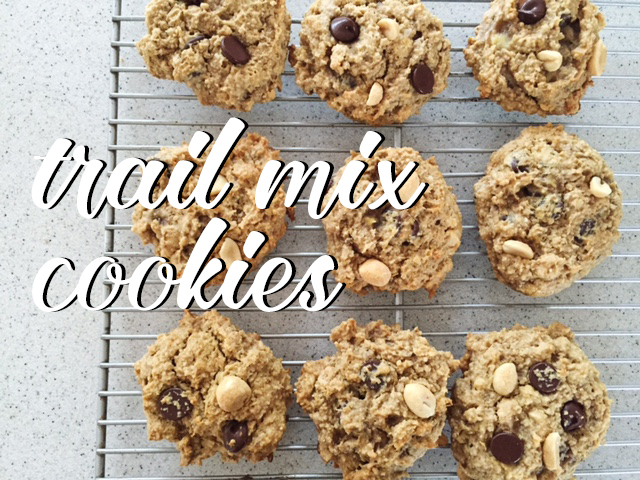 I saw this recipe for trail mix cookies, and they seemed healthy and contained a pretty killer combination: bananas + chocolate + peanut butter. Couldn’t resist. And bonus: no refined sugar AND gluten free. You would never tell – These cookies are very satisfying, so go ahead, eat one for breakfast and dont feel too guilty about it. In a large mixing bowl, whisk together the mashed banana, peanut butter, coconut oil, and maple syrup, followed by the almond milk. Add the oat flour, flax, sea salt, and baking soda, and stir with a wooden spoon until combined. Stir in the oats, banana meal, peanuts, and dark chocolate until evenly distributed. Preheat oven to 325˚F. Prepare a baking sheet and set aside. Using a 1/4 cup cookie scoop, drop the dough onto the prepared sheet then flatten with the palm of your hand. Sprinkle with finely chopped peanuts, if desired. Bake at 325˚F for 14-15 minutes then transfer to a wire rack to cool. Cookies! 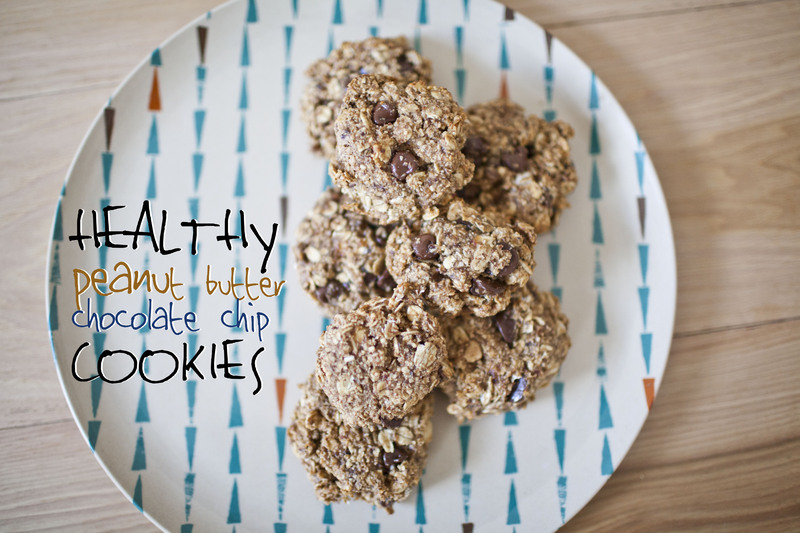 and they are full of nutritious yumminess. No refined sugar and no white flour!! 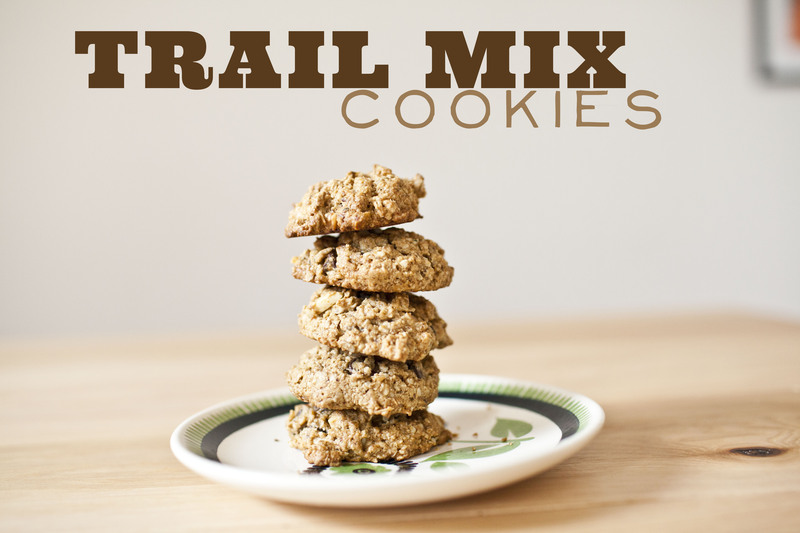 Make sure your oats are gluten free, and you’ve got yourself a gluten free cookie as well….Customize them to your liking with whatever you have in your pantry. Most of all, enjoy! Whisk together the ground flax and water in a small mug and set aside so it can gel up. In another medium sized bowl, stir together the wet ingredients, including the flax egg until thoroughly combined. Add the wet mixture on top of the dry mixture and stir well until combined. This will take quite a bit of stirring until all of the dry patches of flour are gone. Portion small balls of dough (just smaller than golf balls) onto the baking sheet, spacing them a couple inches apart. Bake cookies for 13-15 minutes, until light golden brown on the bottom. Cool on the baking sheet for 5 minutes before transferring to a cooling rack until completely cool. The cookies will break apart easily until cooled, so be careful. Wrap up and store leftovers on the counter or in the freezer, if desired. 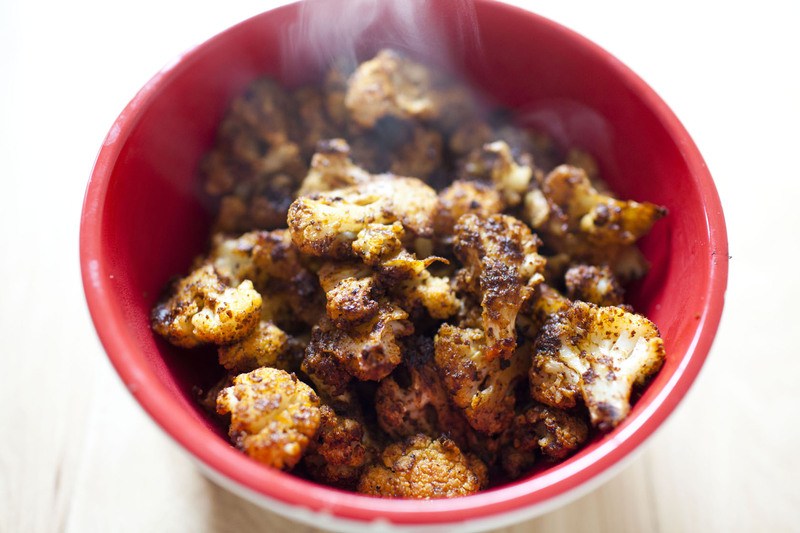 I’m not even sure how to describe this roasted cauliflower. Its bursting with flavor! Cheesy! Spicy! Delicious!! I forsee this being in the regular rotation at our house in the future. We couldn’t get enough of it. The original recipe calls for it to be dehydrated, but I roasted it in the oven, and it turned out fantastic. Create your spice mix by tossing all the seasonings together in a small bowl. Wash and chop your cauliflower into somewhat large pieces (about 1 – 2 square inches). Place the bites in a large bowl and toss with the melted coconut oil, followed by the spice rub. Throughly coat the cauliflower pieces until almost all the rub has coated them. If the spices do not seem to be sticking enough, add about 2 tbs water to move it along. Roast the cauliflower in the oven at 375F for about 45 minutes. 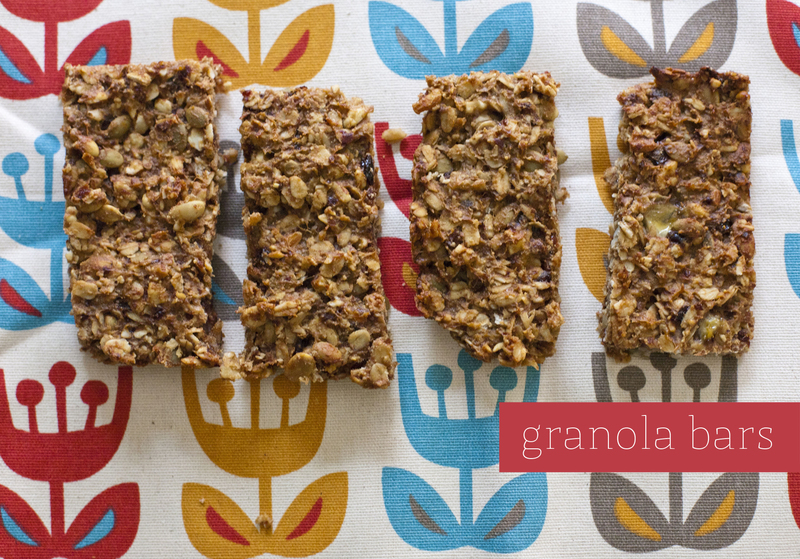 I made these granola bars, thinking they would make a great mid-day snack, as they don’t have any added sugar and are made of high energy ingredients. They are super easy and you can definitely customize to your liking. Preheat oven to 350F. Line wide loaf tin with parchment paper. In a small pot gently heat peanut butter with mashed bananas. Stir until well-combined. Set aside. In a food processor, coarsely chop the almonds, dates, and cherries. Transfer to a bowl and mix in the pumpkin seeds and oats. Fold in the peanut butter mixture. Press the batter into the prepared 8×8 pan. Bake for 20 – 25 minutes. Let cool before cutting into bars.